Are you having trouble with improving the SEO of your website? There are so many factors to consider, and on top of that, how do you perform their execution? Fret not, as we have been through the same situation and came up with solutions. 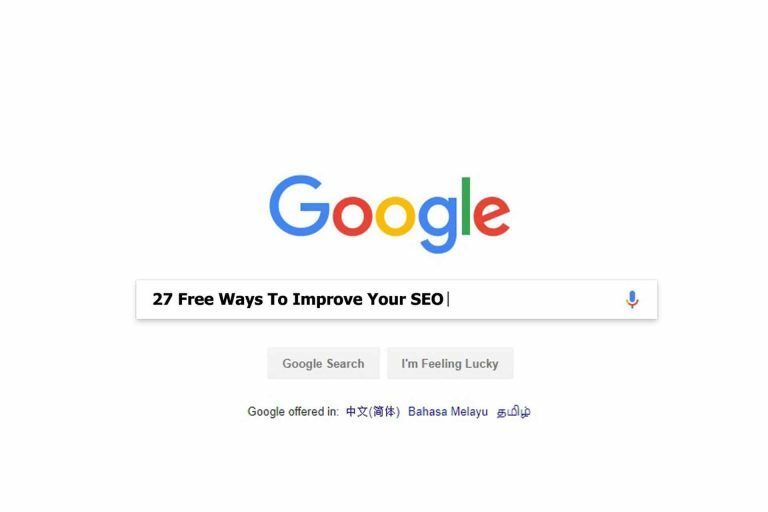 Today, we bring to you a curated list of 27 free ways to improve your SEO, which consists of both onsite and offsite methodologies. When done concurrently, they have the potential to lift your SEO rankings for greater visibility. These are methods you can deploy directly onto the content management system of your website to optimise for SEO. These settings appear when you click on the “Add Media” function and select an image. When a search engine crawls your webpage, it is unable to visually see the image that you are displaying for your audience. What an alt tag does, is to provide a text description in place of the image you are displaying. It allows the search engine crawler to understand what your image about, and gives it SEO value. Here’s the thing to note though: if your image is merely for decorative purposes, there is no need to have an alt tag in place, as it serves no purpose. When you create category pages to accommodate your content, it helps Google and other search engines to differentiate and identify what they are all about. Think of categories as a series of signages that provide directions for search engines to quickly accomplish this feat. When search engines understand your content, it will start to rank for related keywords. If content that are not relevant to the category are placed in it, there would be little to no boost for that post. To sum this up succinctly, having category pages and content that are accurately placed in them will result in a boost in search engine rankings. According to Google’s official guidelines document, they seem to favour websites with adequate contact information. These include email addresses, phone numbers, physical addresses, web contact forms. From Brian Dean’s post about Google’s ranking factors, there is an additional ranking boost if the contact information of your domain matches the ones listed on your website. Basically, there is no downside to creating a “Contact Us” page as it can provide quite a plethora of benefits. For instance, if your business involves the sale of products, having your contact information readily available as a page can generate more leads, as your potential customers would not need to dig very hard to obtain your contact details. Regardless of whether your business is B2B or B2C, it would do you plenty of good to have a specific “Contact Us” page. What’s more shady than not providing your contact details? Not having terms of service and privacy pages! A terms of service page gives your readers a disclaimer regarding aspects of your website, so that in the event something bad happens to the visitor of your website and it does not fall within the scope of your terms of service, you would not be liable for damages. As for the privacy page, it serves to inform your site visitors about the kind of data you will collect from them through their browsers and those that they submit through forms to you. This is particularly important as you won’t want a scenario where you are accused of misusing the personal information of your web visitors, which can be prevented with the additional of a privacy page for disclaimers. This relates greatly to the commonly preached “UX and UI”, which stands for user experience and user interface. The user interface affects the user experience directly, which is why these two terms often go hand-in-hand. A few free and simple tweaks can be done to provide an excellent user experience, as well as place your content in main view of your readers. This would reduce bounce rates, increase dwell time and the number of pages your visitors would view generally. This is with regards to the links pointing to your website. Having all of them come from a single source can signal to Google that you’re using underhanded tactics (link spamming) to boost your search engine rankings. It can lead to your rankings being penalised, resulting in less visibility to your audience. However, if you have links from various sources of websites instead, it is counted as natural by Google’s algorithm. This may be obvious, but is often neglected. Always strive to think in the shoes of your target audience. The biggest mistake people usually make is that their information are useful, but only to themselves. By prioritising the welfare of your audience, it will repay itself by leaps and bounds, in terms of traffic. This is because when you create content useful for your intended audience, they would be more likely to revisit your website, share your content with their friends, and even personally endorse your business! The results from these actions have enormous potential, as they convey positive signals to search engines. For each piece of content you publish that are truly informative, the positive effects are compounded, which can catapult your website’s visibility onto the front page of search engines. This is a major ranking signal that should not be ignored. It is considered as a prerequisite to rank. If you want your website to rank for certain keywords, you will need to ensure that the keyword you want to rank for is present within the first 100 words of your content. The further in front, the better. This is because search engines scan for relevancy right from the start of your content. Make sure to pay extra attention to this point as search engines place extra emphasis on this ranking signal. Although meta-description has no direct correlation with being a search engine ranking signal, optimising it can still yield dividends. A meta-description is something your human audience would be able to see. Make the meta-description enticing enough, and your audience would click through. This is especially valuable if your content provides great value. If your web visitors do not even enter your website due to a badly-written meta-description, how would they be able to view your awesome posts? The meta-description, along with your page title function as a gateway between the search engine and your audience. When done correctly, it can boost your site click-through rates, which is yet another positive signal to search engines. Just a precaution though, do ensure that there are no duplicate meta-descriptions for your various posts. This can lead to penalisation by search engines! Other than that, just make sure that your meta-descriptions are appealing such that your audience are interested to click on it. And that’s all for meta-descriptions! You should generally stick to short URL lengths as search engines have a character limit for displaying them. If your URL length is too long, it is highly likely that the search engine would truncate your URL name when displaying it. This can cause web visitors to not know where they would land after clicking, and not click on the search result to your webpage as well. Another point to note here is that by having a shorter URL, it can occasionally lead to increased direct traffic as the web user manages to remember the name of your page. Why this is so is because short URLs are usually named intuitively, which makes it a lot easier to remember. Let me quote an example: “*****.com/seo-guide” compared to “*****.com/yourtrustyandcapableseoguidethathelpsyouachievemore”. Which URL do you think you will remember? The shorter one that says “seo-guide”, right? As you can see here, by having a short and succinct URL, it can generally improve traffic flow to your webpages. Thanks to the increasing popularity of smart devices, the internet is now literally at your fingertips. Our mighty brother G has also noticed this trend, so the “Google Mobile Friendly Update”, dubbed as the “Mobilegeddon” by SearchEngineLand, was introduced on April 2015 (fun trivia, wasn’t it). Basically, lots of algorithms were introduced such that websites that had a smooth and excellent browsing experience on mobile were given a boost in their rankings, whereas the websites which were not so optimised for mobile surfing experienced a drop in their rankings. The end of the line is that you should strive to make your website and pages accessible to both computers and mobiles, and that would at least ensure that your rankings in search engines are preserved. This can mostly be done by making the UI smooth to navigate, and your webpage fast to load. Remove bloated code and unnecessary elements from your website to achieve it! Example of an optimised image, in terms of resolution and size. This can help to reduce the time taken for your pages to load. An optimised image refers to an image that has been resized specifically for your website, and then compressed to reduce file size. All images should have uniform dimensions for consistency. This helps to speed up the loading time of your website, which can be a significant reduction if your posts and pages contain a lot of images. A popular free tool used to reduce image size without losing quality is TinyPNG. You can batch up to 20 images at once to compress, but each original image should be lesser than 5 MB in size. As mentioned previously, informational content is important to aid your readers. Quality content, on the other hand, is equally as important. Other than providing value, it helps if your content is unique. Original content can be content from your point of view, content currently not found in search engine searches, or even a gigantic resource page uniting all the available resources floating around the internet! When you produce original content, search engines will be able to take notice, and this may give your webpage a boost. Of course, your content must be useful for your audience as well, not having just a clickbait title linking to it. It must inherently provide value. The different kinds of header tags. This is particularly important for search engines to understand what your post is about. The post can be segregated into different segments, using heading tags. Typically, the title of your post should always have a H1 tag. Main ideas should have H2 tags, and additional points under the main ideas should have H3 tags. If there are sub-points under your additional points, which are an extension of your main ideas, you can use a H4 tag. The maximum you can go is till the H6 tag, which generally isn’t used much. H1, H2 and H3 tags usually generate the most effect, SEO-wise. So essentially with header tags, you’re generating a post structure which will bring visibility to the search engines. Do you like to read content written like this? Its SEO value is a widely debated topic. However, even if we conclude that it has no direct bearing on SEO, it is still indirectly linked to it. You see, people correlate proper grammar with quality content. If a post contains multiple grammatical errors, trust and credibility will inevitably slip away. This takes away from the authority of your website, reducing dwell time and increasing bounce rate. Ultimately, a negative impact on SEO is observed. You can use Grammarly to check for fluency and grammar before you publish your post, as it’s pretty useful! As of the Google Caffeine update, there is extra emphasis on the recency of a page’s content. If your page content is time-sensitive, it would do a lot of good to update it regularly as Google has decided to show the date of the last update for such pages. And this is only for the search engine side. On the web surfer’s side, it lets them know that the page is updated consistently, and contains largely accurate information at the time of visit. It builds trust and can result in the web surfer revisiting your website, which is a huge plus! See, this website is secured by SSL! This is the button you see beside the URL that says “Secure”. It means that the website is secured with a SSL certificate. The website will also start with “https” instead of “http”. It helps to encrypt sensitive information that you send to the website, and used to be important only for e-commerce sites. However, Google has started to use the presence of “https” as a ranking signal recently, meaning that they index SSL certificates. So what does this mean? It means that it is time to utilise a SSL certificate for your website as well. Some domain sellers include a free SSL certificate when you purchase a domain from them. If you do not have one yet, you can visit LetsEncrypt to obtain one for your website. Title tag filled with keywords. This is the bread and butter of relevancy. The title-tag is one of the most important factors for SEO. Why is it so important? It’s because it helps the search engine and users to identify your topic. Therefore, the keyword you are looking to rank for should be in your title tag, and even better if your title tag starts with it. This is because according to Moz, title tags that start with the keyword tend to perform better than title tags with the keyword located near the end. The speed at which your website loads is a major ranking signal for search engines. It is said that 53% of users abandon a webpage when it takes longer than 3 seconds to load, as reported by Google on September 2016. Therefore, it is extremely important that you optimise images and remove bloated code in your pages and posts as they can slow down the loading speed of your webpage. These are methods that are conducted without touching the backend content management system of your website, therefore they are known as “offsite” methods. This is how the disavow tool page looks like. Spam links that direct to your website or webpage are considered as negative SEO, and if left alone, can cause your website to be unable to rank on search engines. This is because Google will associate your site with the shady websites that directed those spam links to you. As a result, your domain is penalised since you are considered as “gaming” with their system to rank, which is not the case. Enter the superb tool that will solve this very issue: disavow links. This handy tool allows you to inform Google to not take into account certain links when assessing your website for ranking. With this, you can effectively discount the links that are causing harm to your website rankings. Maximum website uptime is a sign of reliability, which search engines take into account. When your website is down most of the time, there is an extremely high chance that the Google web bots that crawl the web will encounter an error message when trying to access your site. This triggers a red flag in part of their algorithm that your website is not functional. This can be extremely detrimental. At best, your website ranking would drop. At worst, your website may be de-indexed from the search engines altogether. Reliability and consistency go hand-in-hand, so make sure you have backup servers for the event that your website unexpectedly goes down! Although this has a greater effect on local SEO, it still serves as a ranking signal. When you have good Google reviews by satisfied consumers, you will have a high rating for your business. People generally like to read reviews by third-parties as they are not prone to biases. With a good Google rating of your business, it will increase the click-through rate of potential customers that happen to chance upon your company while searching for relevant keywords. This increase in click-through rate, coupled with an increased traffic as an effect is a good quality ranking signal for search engines. This is how it contributes to an improved ranking in search engines. Expand your social presence to aid in SEO! This serves as a credibility signal to Google. Legitimate businesses tend to have their own official Linkedin company page. In the eyes of search engines, if there is presence of such a page, it bolsters credibility for the company. Furthermore, Linkedin can be a source of backlinks for your website, and it’s also free to register, so why not utilise it? Having a social media presence can help improve SEO as well. It also provides a backlink to your website through your profile information. Your follower count(real humans) and posting frequency will provide a ranking signal to the search engines. By being active on social media and interacting with your followers, it will provide a boost to your website’s SEO. A sitemap is a skeletal layout of your entire website, and is pretty useful for search engines to know where to crawl for information. By submitting your sitemap to Google Webmasters, it allows efficient crawling of your website by Google bots, and helps to index pages that are new to your site, which affect the rate at which they start to rank for keywords. A popular WordPress plugin used to automatically generate your sitemap is Yoast SEO, which also helps you gauge the SEO readability of your content for search engines. Another popular alternative plugin is Google Sitemaps, which is entirely focused on the generation of sitemap for your website. Even if you have already submitted your sitemap to Google Webmasters once, you can still re-submit it if not all of your existing pages and posts are indexed in the search engine. This is a tag commonly used on content that you’re cross-posting to other sites. This alerts Google that this duplicate content originated from your website. With this, you can ensure that your website does not get hit with a penalty for duplicate content. In fact, with the use of rel=canonical tags, you point the original article back at your site to prevent fast-moving web scrapers from reposting your content and then being ranked for as the original version. These two tools are basically your data-interpretation tools. Google Analytics allows you to track traffic and how users interact with your website, while Google Webmaster Tools show you how search engines interact with your website. By optimising your website for both human and search engines with the help of these two tools, it will lead to improvements in ranking of your website, so use it well! A great job for reading this far, you deserve a pat on your back! Just to conclude, with so many methods available to optimise your website for SEO, there is no excuse why you are not working on SEO efforts for your website! Just do it! If this is still too foreign for you and you require SEO services for your business needs, please contact us and we will aim to help you achieve greater heights.